This center provides information on services available in Tucson. 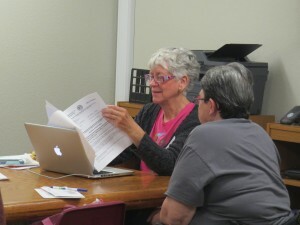 Volunteers assist clients completing applications online for DES services. They are able to order replacement Arizona identification cards (not expired) along with putting $5.00 once a month on economy bus passes and notarizing documents. There is also be referral information for other agencies. The Resource Center is located on the lower level of the main Trinity building. The entrance is in the South parking lot and it is near the Food Pantry. The hours are Tuesday and Thursday 12:00 – 4:00 pm, their direct phone number is 520-622-0149.